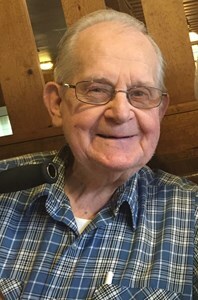 Newcomer Family Obituaries - Velmer A. Adkins 1926 - 2018 - Newcomer Cremations, Funerals & Receptions. by his loving wife, Wanda Adkins of Springfield, Ohio, formerly of Norton, Ohio; Son, Roger Adkins (Carol) of Springfield, Ohio; Daughter, Rita Rhodabarger (David) of Effingham, Illinois; Granddaughter, Kimberly Adkins-Hubbard (Jason), Great-Grandsons, Andrew and Aden Hubbard of Springfield, Ohio; Granddaughter Stefanie Rhodabarger-Hendrickson (Mark), Great-Grandsons Nick, Charlie and Great-Granddaughter Bea Hendrickson of Selma, Indiana; Granddaughter Elizabeth Rhodabarger of Effingham, Illinois. Grandson, Jonathan Adkins (Trisha) of Springfield, Ohio, Great-Grandson Drew Adkins; Grandson Ben Rhodabarger (Shannon), Great-Granddaughter Emma Rhodabarger and Great-Grandson Tanner Rhodabarger; Brother, Basil Adkins of Shady Springs, West Virginia. Velmer was preceded in death by his father, mother, one sister and four brothers. Funeral Services will be held Friday, December 7, 2018 at 1:00 p.m., at Arlington Church of the Nazarene, 1057 Triplett Blvd. Akron, Ohio 44306. Pastors D. Frazier and E. Morrison will be officiating. Burial will follow at Greenlawn Memorial Park, Akron, Ohio. Family and friends may visit at the church prior to the service from 11:00 a.m. to 1:00 p.m.
Add your memories to the guest book of Velmer Adkins. Velmer was such a kind and godly man. I loved worshiping at Arlington with both of you. After Dan passed away, he tried to get my lawn mower running. I surely appreciated his efforts. Our deepest sympathies to your family. Our thoughts and prayers are with you all. John and Dima Adkins and family. 2nd son of Claron Adkins. We were so sorry to hear of Velmer passing, and you are in our thoughts and prayers during this difficult time. We will miss Velmer and his smile and soft spoken, Christian manner. So many wonderful memories of fun and laughter, in the Nazarene Church and our monthly outings. Love Elsie, Gar, and Alan Gibson, and Jean Gibson Ruble. Oldest Son Of Claron V Adkins. My deepest condolences to you All.